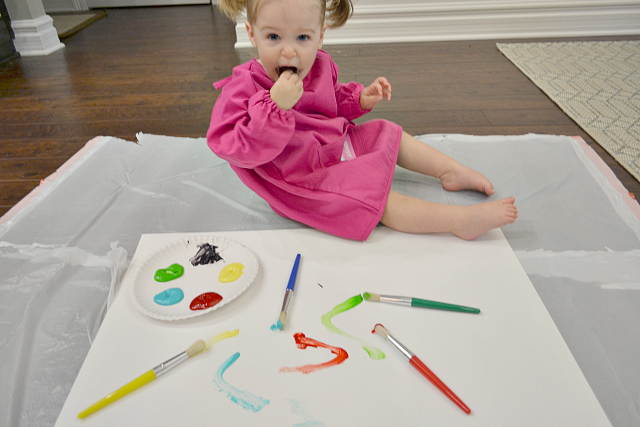 Fawn Over Baby: Stuck On You: Art Smock & Label Review + Free Shipping Code! 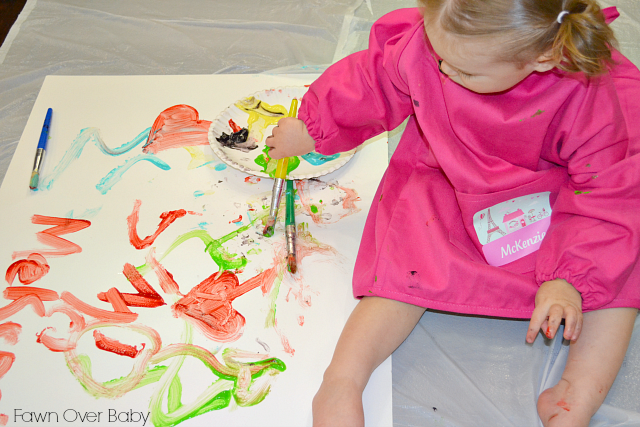 Stuck On You: Art Smock & Label Review + Free Shipping Code! 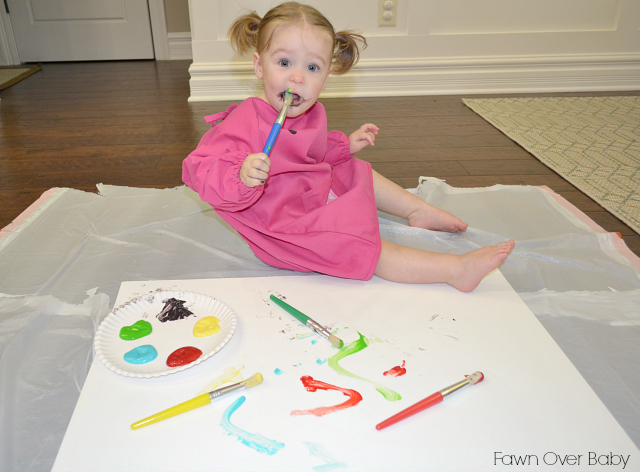 It's painting day again here on Fawn Over Baby! 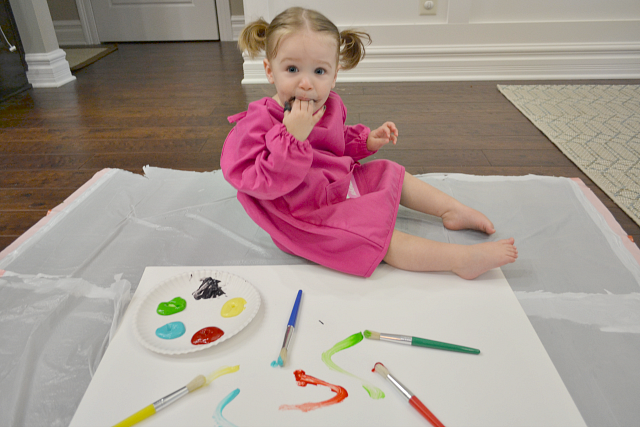 Actually this is our trial run painting session I was telling you about on Saturday's post, DIY: Edible Paint Recipe For Baby. As I said previously, I've always avoided "paint projects" with Kenzie because I knew all she would be interested in doing is eating the paint or brush and/or possibly wiping paint all over the house - I know I'm such a mean mom. 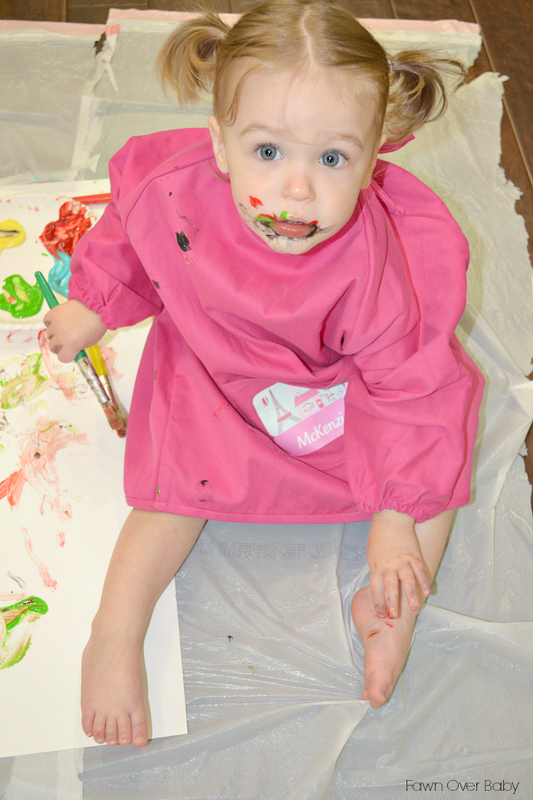 However, now that she is a bit older and has the concept of coloring down pat, I thought why not throw caution to the wind and let my poor paint deprived baby have some fun with a little edible paint I mixed up. Well today I had a little help from the wonderful labels and gifts company, Stuck On You to ease Me McKenzie into the new world of painting! Known for their trendy labels and tag designs, Stuck On You also offers a variety of fun-filled personalized products that any child would be thrilled to own. 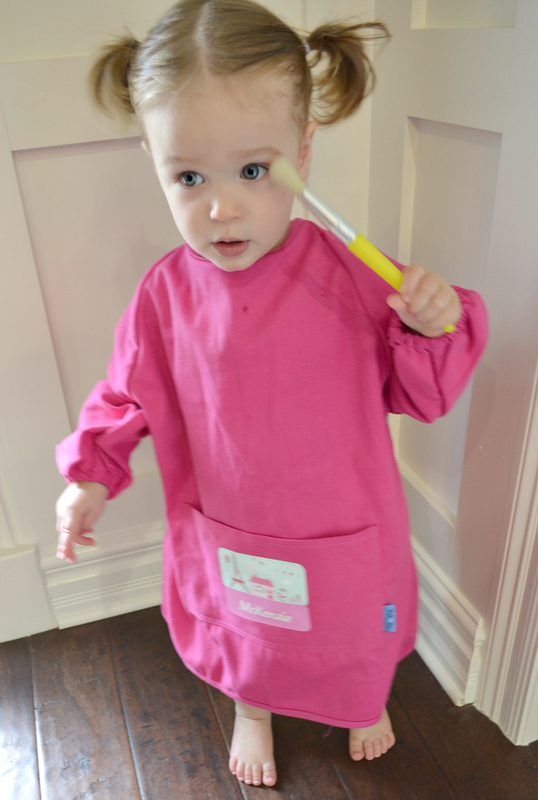 Today I am sharing with you my personal favorite so far, this delightful pink Art Smock for kids as well as their adorably designed spring Kids Designer Name Labels & Classic Clothing Dots! 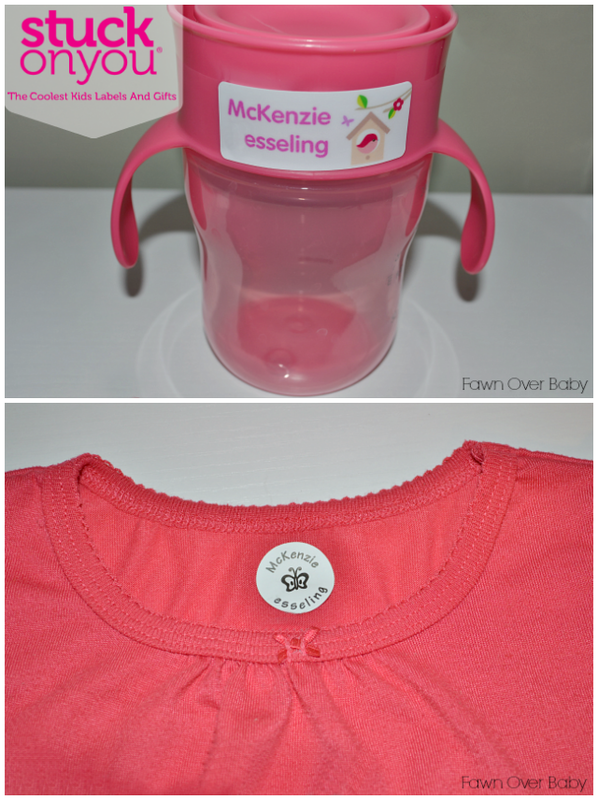 Stuck On You: Kids Labels & Gifts is no stranger to Fawn Over Baby as I have partnered with them many times in the past. We love working with them and absolutely adore their kid-friendly products! 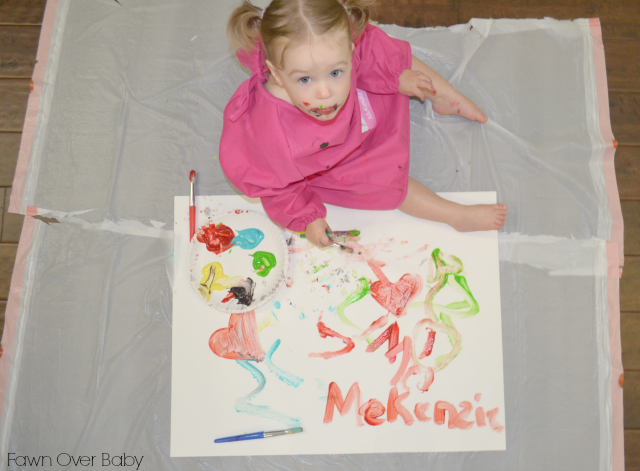 This adorable personalized Art Smock that McKenzie is wearing is just one of the many exciting items you will find when shopping at Stuck On You.com! 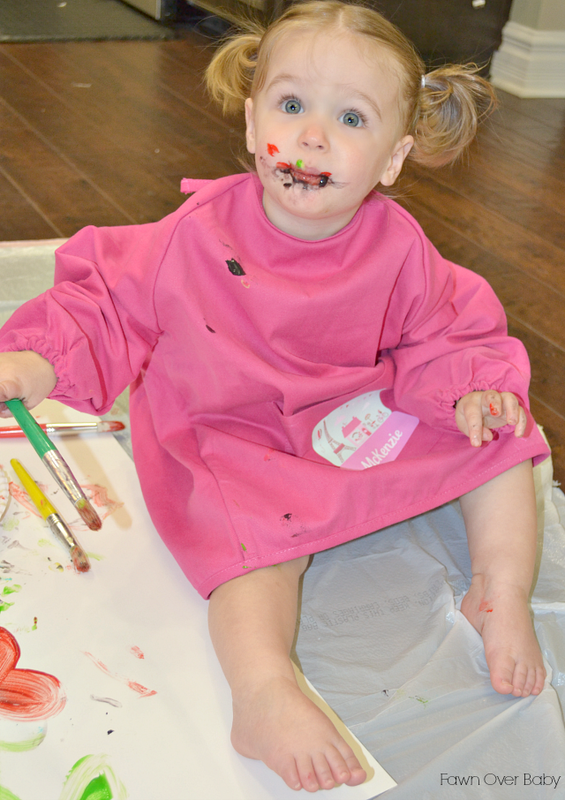 We received this sweet pink smock just in time for her very first painting session last week. 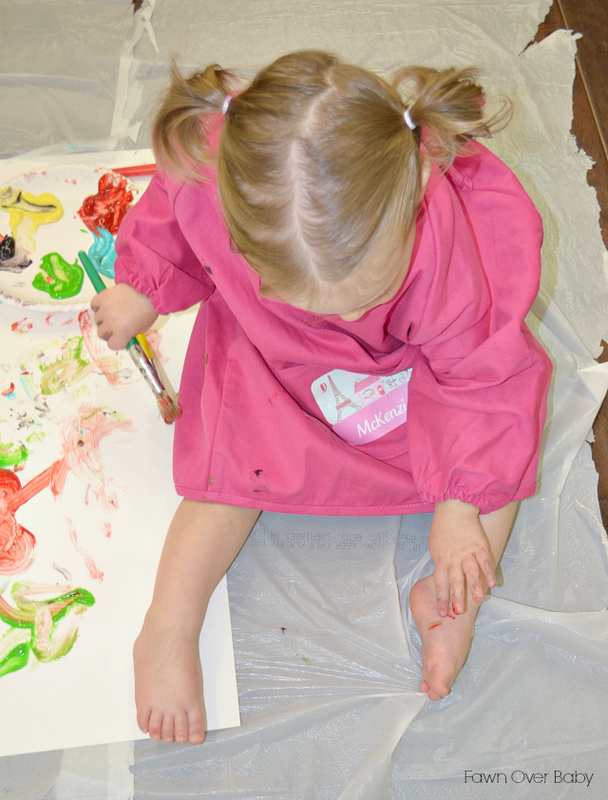 To be honest, I've come across a few art smocks that seemed flimsy, easy to pull off and probably wouldn't protect as much as I would like. This smock from Stuck On You is on an entirely different level. Made from quality cotton canvas that is thick and durable, this construction is everything you would hope for in a child size smock. It has an easy tie up back and elastic wrist cuffs allowing for maximum coverage while arms are in motion. 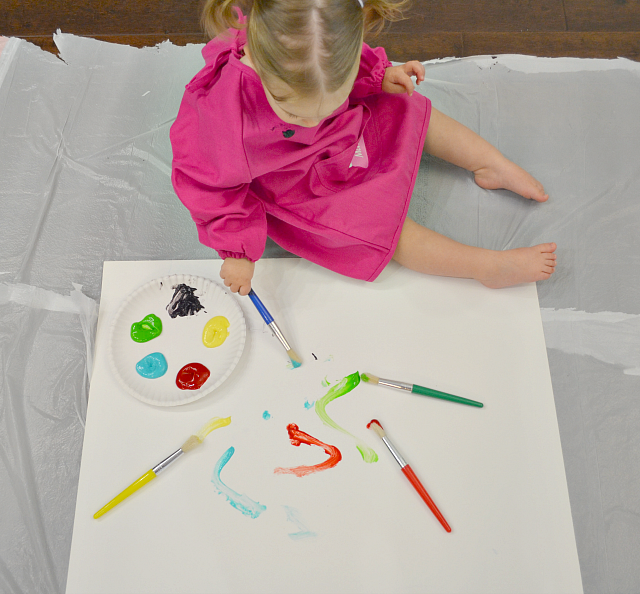 This high quality smock also has a front pocket to hold extra paint brushes or art supplies for easy accessibility and can be personalized with an on-trend design of choice. I chose this charming Eiffel Tower/Paris design for my little artiste! 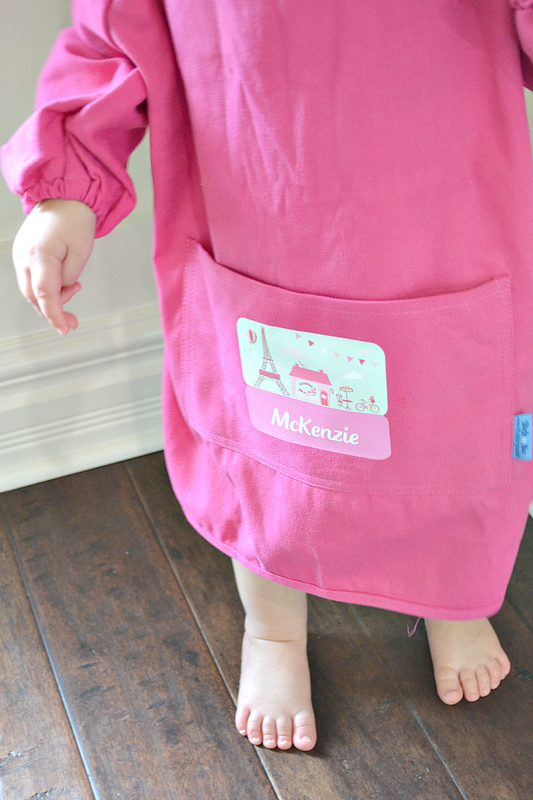 Kenzie is only 18 months and even though she is tall for her age, I was nervous this smock might be too big for her as it is listed for children 3+. I did have to over tie a little bit in the back, however because of the elastic wrist cuffs, it fit and covered her wonderfully! I'm glad to know that it will definitely grow with her as her art abilities expand. 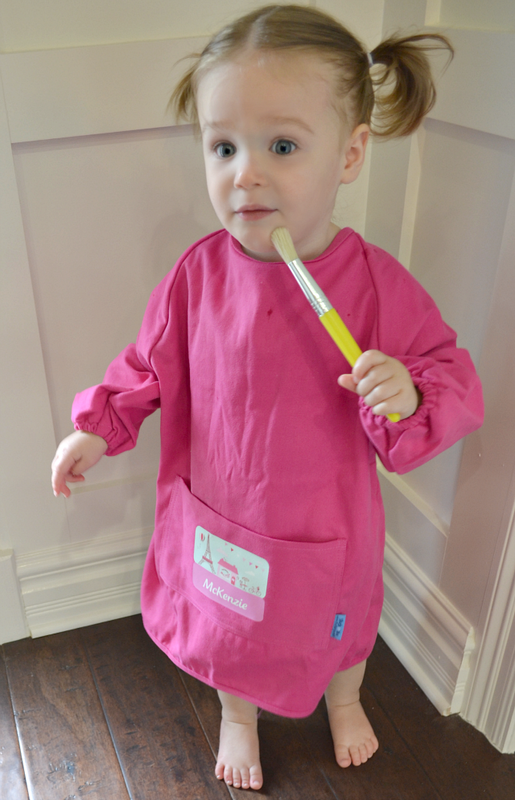 This precious little smock is very easy to clean and machine washable! I actually just spot treated the few areas that had paint on it with water and soap and it was clean and good as new in no time! Who wants a clean smock though, right? Isn't it kind of fun seeing little reminders of art projects from the past? 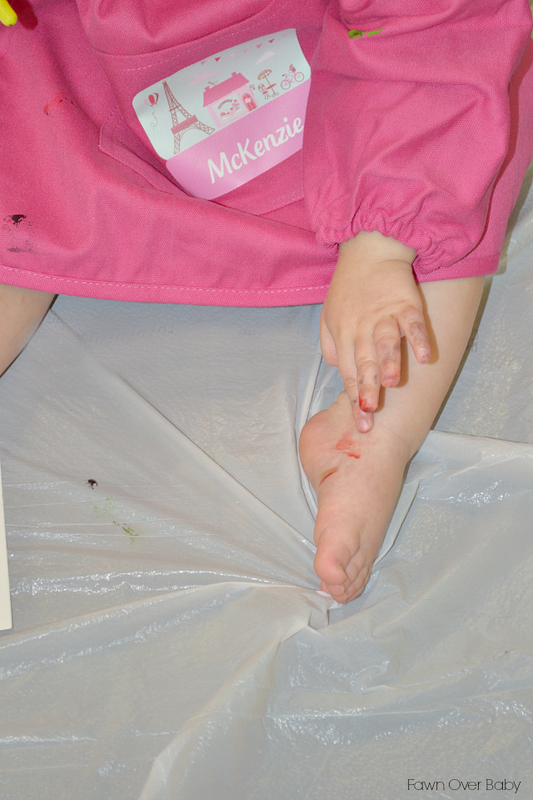 McKenzie did get a little bit of paint on the side of her foot and was so concerned about it, she felt the need to keep pointing and showing me her painting wound, lol! I had to get a close-up, as I'm sure she would really appreciate that I made it a big deal here on the blog. I'm excited with how well McKenzie's first paint experience went. I will definitely plan more now that I have this adorable smock available for those days I'm wanting to avoid a bath time clean up. Also, if you haven't tried out their Kids Designer Name Labels, they are wonderful as well! Not only can you customize them to your design and font of choice, they are a great way to keep your child's items free from the accidental switch-a-roo at school! I put these labels on all of McKenzie's sippy cups, her diaper&wipes case, etc. I also love the Name dot labels as well! I use them often to put onto McKenzie's clothes so they don't accidentally wonder off to a new home. If you are loving what you see then I know you will love and use Stuck On You items for many years to come! If you are ready to try out their amazing products , Stuck On You is offering all Fawn Over Baby Readers FREE SHIPPING when you use code: Fawn14 at checkout! To stay up to date on all their new product releases and shop announcements, feel free to follow Stuck On You on Facebook, Twitter & Google+, Instagram & Pinterest!! So adorable.....always a good idea to have things like this to be a little big. What fun! !